FarmIMPRESS is an extension of VetIMPRESS which allows farmers to see data and insights about their animals. FarmIMPRESS enables vets to better communicate with Farmers about their livestock and farm conditions. 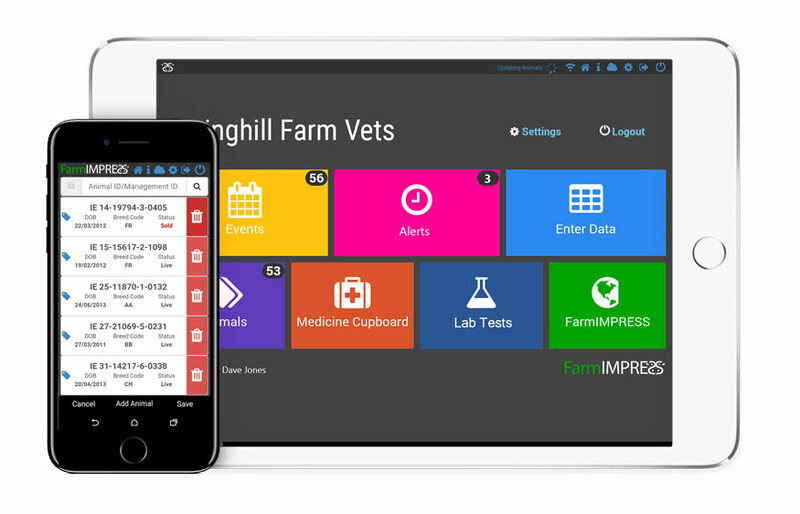 Real-time information from your vet practice including vet reports, lab results, medicine advice scripts and treatment reminders. Both farmers and vets can set reminders and alerts to coordinate checks and administration of medicines. Farmers and vets can coordinate medicine stock in real time. Your vet can prepare medicines before a call. Allowing farmers to collect intelligent animal data and make informed decisions on animal health for the future. Our vet practice setup FarmIMPRESS for us around 12 months ago. It allows my vet and I to coordinate on the farm. But most useful for us is the gathering of animal health data. We can plan treatments and breeding much more effectively. I’ve recently introduced my farms to FarmIMPRESS. I can make more informed decisions at routines and collect all the data through my VetIMPRESS app whilst scanning to help me give the best advice at subsequent examinations. The FarmIMPRESS app is available to download from the App Store and Google Play. You’ll need a login to use FarmIMPRESS. Please ask your Vet or Vet Practice.